Thank you Vital Proteins for sponsoring this post! All opinions are my own. 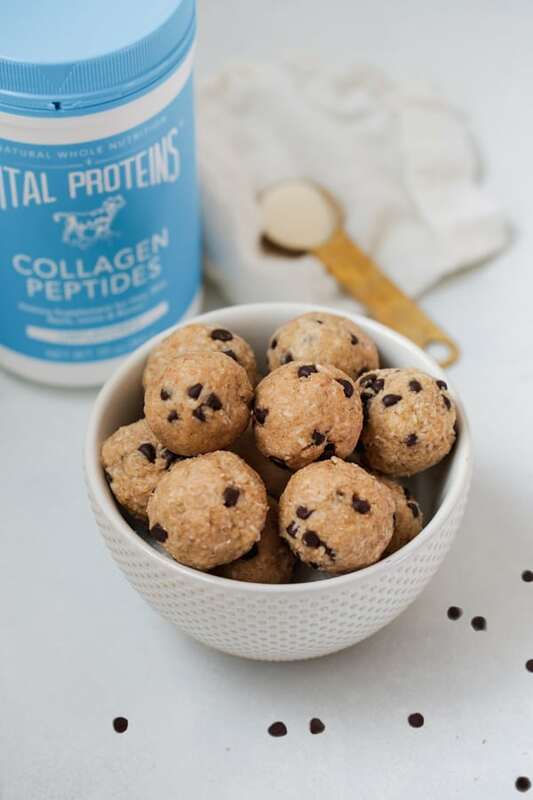 These No-bake Cookie Dough Collagen Protein Bites are the perfect no-bake snack to satisfy your sweet tooth, while also adding protein. They’re paleo, AIP, and gluten-free. I could probably eat cookie dough by the spoonful. I mean… I’m sure I have on multiple occasions. My mom used to buy pre-made cookie dough that you would bake at home, and it would rarely make it being a full-on cookie. Cookie dough has always been one of my favorite indulgences, ice cream flavors, and protein bar flavors. Seriously, who doesn’t like cookie dough? Needless to say, cookie dough is pretty much just pure sugar and has little redeeming qualities, nutritionally speaking. I would always just feel like junk whenever I had it! So why not make a cookie dough from all real food that features fat and protein as well? 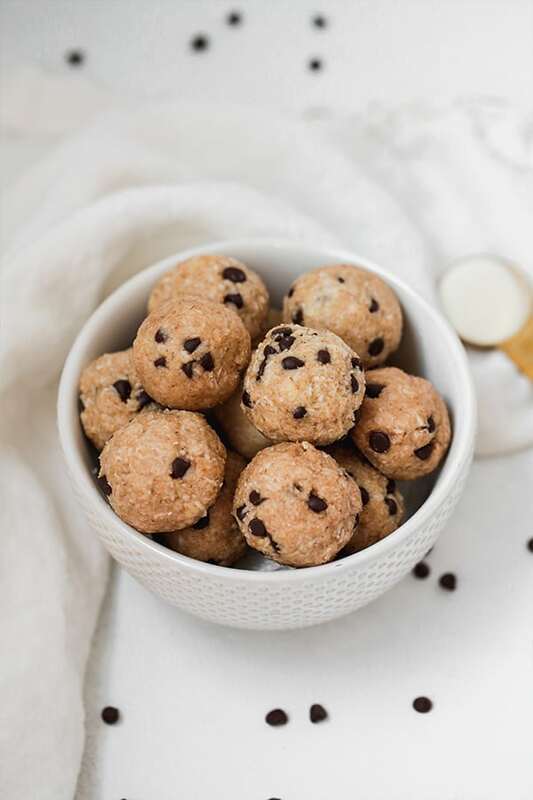 These cookie dough collagen protein bites are such a fun and simple snack for cookie dough lovers! No-bake… need I say more? Not only does that mean not turning on the oven, but let’s face it, unbaked cookie dough just tastes amazing. 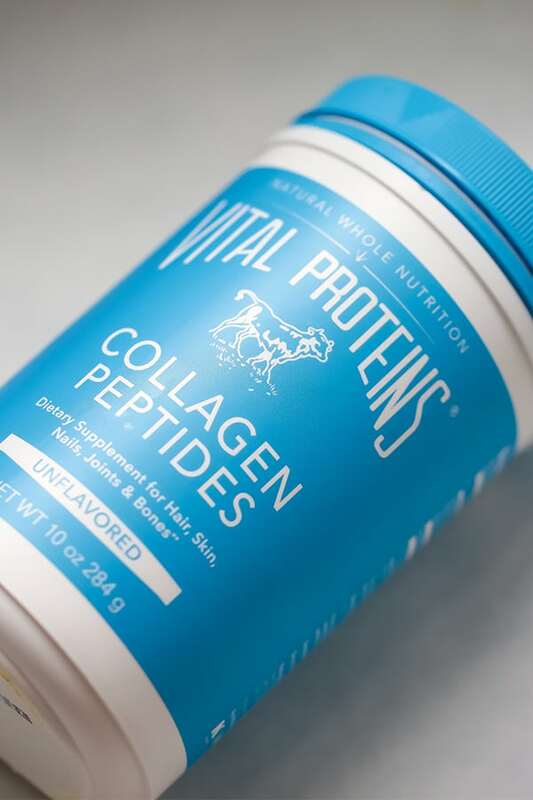 I never let myself run out of Vital Proteins Collagen! This collagen is amazing for supporting the health of your hair, skin, nails, gut lining, and it adds a protein boost. I always find myself feeling more satiated whenever I add Vital Proteins to snacks. The added protein helps keep you full and it ups the overall nutrient factor of this snack. Just combine all of the ingredients, roll them into balls, and you’re good to go! This is the base of the protein bites, and I have not used any other substitutes. Tigernut flour is a nut free flour (tigernut are a tuber) but you can also sub almond flour if you’re not AIP and tolerate nuts. Just two scoops are all you need to up the protein in this snack. This acts as both a binder and a natural sweetener. 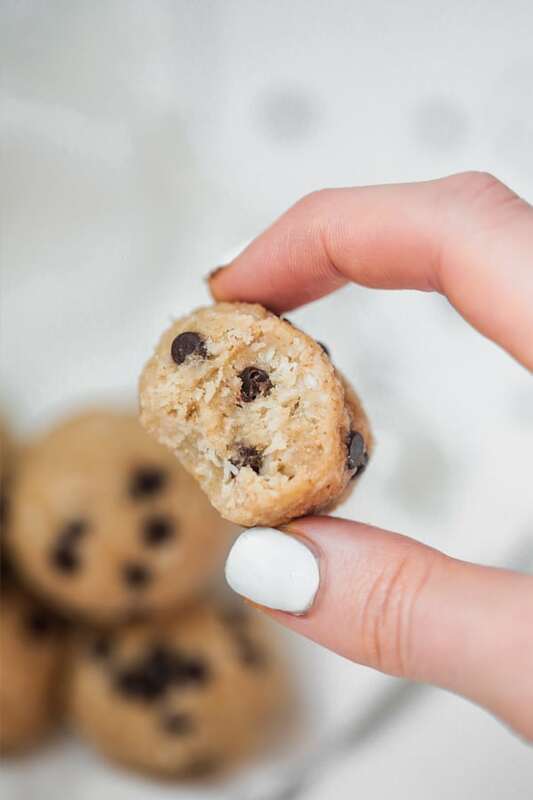 You can either use dairy-free mini chocolate chips if you tolerate that or if you’re AIP, you can use the recipe listed here to make your own at home! Combine the tigernut flour, shredded coconut, and collagen in a medium bowl and mix. Stir in the maple syrup and coconut oil and stir until well combined. Mix in the mini chocolate chips (or the carob chips below for AIP). Prepare a plate lined with parchment paper. Begin rolling the mixture into balls (you’ll have about 7-8) and place them on the plate. Finish with sea salt if desired. Chill in the fridge for 1-2 hours or until solidified. Prepare an 8×8″ pan lined with parchment paper. Melt coconut oil on low heat in a saucepan on a stove top and stir in the maple syrup when liquid. Set aside. In a separate bowl, add the carob powder. Slowly pour in the liquid and stir to combine with the carob powder. Pour the mixture into the pan and chill for at least an hour in the fridge. Carefully remove from pan and chop up into small chips to add to the bites. Looks great! Do you have the nutrition info on these? Thank you!! I don’t share nutrition info for my recipes, but there are online calculators that you can use. I have a different collagen powder. About how much is 2 scoops? These were so easy to make and SO good! I was surprised by how much flavor and sweetness they had. This will definitely be a new go-to snack! CAn I substitute the maple syrup with stevia ? You would need something liquid to hold it together, so I’m not sure stevia would work. Do you know if the maple syrup can be substituted for something sugar free? I haven’t tried that in this recipe.. you would really need the sticky maple syrup to hold it together so I’m not sure what you could sub it with. Any subs for someone that doesn’t eat coconut (almonds are ok). Thanks! Hi Anna. I’m not sure if I know of anything that would work other than coconut here. Sorry! Can you sub coconut flour instead of tigernut flour in this recipe? I haven’t tried that but let me know if you do! The mixture tastes yummy but I can’t get mine to stay together. It’s very crumbly & I followed your directions to a T! Any thoughts? These are SO easy to make and my absolute go to treat. Love, love, LOVE! I swap out the maple syrup with honey……. And the carob chips recipe…………. Honestly better than chocolate in my opinion. THANK YOU FOR SHARING!!!!! ???????????? Can you substitute cansava floor for the tigernut? I haven’t tried that swap, but let me know if you do! How much is in 2 scoops of the collagen? I’m using a different brand and it has no scoop.